Owls consume their prey whole, regurgitating solid pellets of indigestible bones, beaks, claws, feathers, fur, teeth, scales and insect exoskeletons. 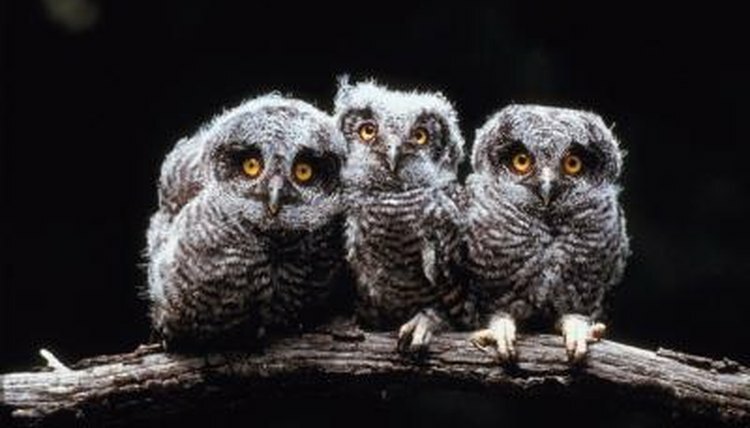 Because prey is consumed whole, owl pellets contain the whole bones of complete skeletons. Researchers and students dissect the pellets to discover information about food chains and the diets and biology of owls and their prey. Other raptors, such as eagles and hawks, produce pellets, but these contain fewer indigestible animal parts. Owls form pellets soon after eating, but don't regurgitate them until they're ready for their next meal. Owl pellets are soft and moist when regurgitated, but dry out quickly. They're usually 1 to 3.5 inches long, cylindrically shaped, dark colored and smooth. However, depending on the owl species and what he's eaten, the pellets may be irregularly shaped and furry. Most are tightly compacted, but some are loosely formed. Owl pellets can be dissected by soaking them in warm water, or simply breaking a dry pellet in half, gently pulling apart small pieces and carefully rolling them between your fingers, extracting the skulls and tiny bones. Researchers and students can reconstruct the skeletons using a bone identification chart to sort and compartmentalize the bones. Even 5- and 6- year olds can successfully dissect pellets and reconstruct skeletons. The composition of an owl pellet leads to many discoveries. What the owl eats, and the biology of his digestive system, the biology of his prey, food chains and the significance of inter-relationships between species are revealed. Distinctive qualities and changes in environments and ecosystems can be monitored through owl pellet examination, sometimes revealing a species new to the area. Because owls are found world-wide, except in Antarctica, regional differences between species can be compared. Self-contained ecosystems, owl pellets are used by carpet beetle larvae, clothes moth larvae and fungi for shelter and sustenance. Moth and beetle larvae consume fur and feathers, leaving tiny black specks of caterpillar droppings, which can be seen in the dissected pellet. When they're ready to undergo metamorphosis, the larvae form their cocoons near the host owl pellet, using fur in it's construction.